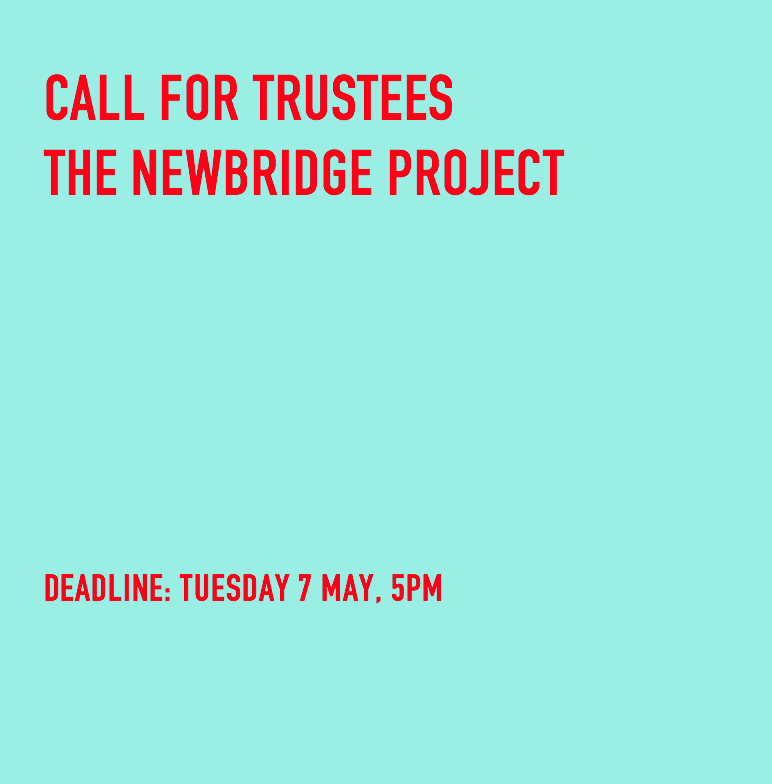 The NewBridge Project is currently looking for dedicated and motivated individuals to join their Board of Directors to take up the role of Trustee. The NewBridge Project is an artist-led community, supporting the development of artists and creatives through the provision of space, artist development programmes, curatorial opportunities, and an ambitious artist-led programme of exhibitions, commissions and events. Our programme is based on an artist-led model with studio members and the wider artistic community creating a programme responsive to the social, political and civic environment within which it exists, and aims to be a genuine community resource. We are at an exciting period in our organisation’s development and it is essential we continue to build on our success to ensure the long-term stability and sustainability of the organisation. Our current trustees include: Julia Bell (Chair), Julia Heslop, Ray Mills (Treasurer), Ilana Mitchell and Paul Richter. Please see Trustee bios here. An enthusiasm for and understanding of the work and ethos of The NewBridge Project. A commitment to carry out the duties of a Board Member. The ability to work as a member of a team and a willingness to state personal convictions and, equally, to accept a majority decision and be tolerant of the views of other people. A preparedness to offer personal and business skills and experience to support the work of staff when required. A commitment to be well informed about the work of The NewBridge Project. A willingness to act as a champion for The NewBridge Project. The ability to treat sensitive information confidentially. We are keen to widen the diversity of our board members and expertise, and encourage applications from all backgrounds and experiences, irrespective of ethnicity, social / economic status, age, gender and sexuality. There is no requirement to have previous experience of sitting on a Board. All trustee roles are unpaid, but we support travel and childcare costs, and aim to hold meetings at times that can accommodate trustee’s work / family / personal commitments. Please download the Information Pack for full details and further information about The NewBridge Project and the role of the Board of Trustees within this.